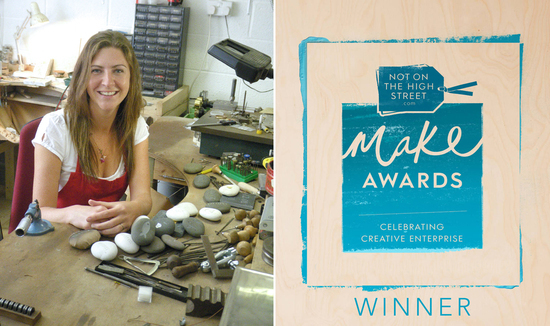 Letterfest Engraving is the creation of graphic designer, Wendy Harrison who lives and works in North Devon. I have designed a range of gifts that are handmade to order, personalised with your details to make each one unique. 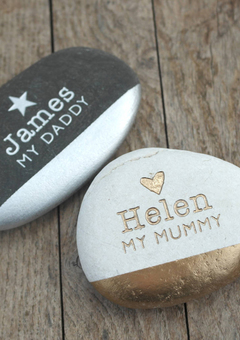 The range includes pebble keepsakes inspired by the natural landscape of the North Devon beaches, wooden decorative pieces and personalised jewellery. The pebbles we use are river pebbles, eroded smooth and flat from years on the river bed, sourced by a landscaping company in the South East. As a natural stone they differ in size, shape and colour and contain natural imperfections. 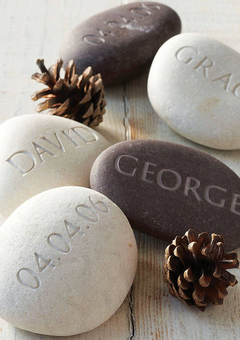 We have taken a rough, organic product and left it in its natural state, engraving the type like a stamp in the stone. If you are inspired by any of our products but want something bespoke, please do contact us via the 'ask seller a question' tab on each product page. Our range of art prints, illustrations and stationery can be found at our second shop LETTERFEST. We have been awarded Creative Business of the year 2011, Best Customer Service 2012, Best Children’s Gift 2016 for our Daddy and Me Book, and were shortlisted for Gift of the Year 2015 for our Wedding Venue Illustration. We produce everything to order, so please contact us if you have a bespoke request. "I love these! This is the fourth that I have ordered for friends and family significant birthdays!" "Fabulous quality items, to personalise and treasure for ever. Unique idea. Have had these for previous weddings and all have been thrilled. Hopefully my daughter will be just as thrilled on the day!" "I lost my cat at the beginning of January and a friend had bought me a plant that will flower at this time every year. We had it potted and your pebble sits just inside. It's a beautiful, natural reminder of our dear little friend..."
"Absolutely brilliant, good quality, prompt service, excellent packaging so all arrived in excellent condition. Would recommend to friends etc." UK SHIPPING - Your package will be posted tracked first class and takes about 2 days. Sometimes parcels do take longer, especially at busy periods like Christmas - so please leave plenty of time for ordering! INTERNATIONAL SHIPPING - Your package will be posted using international airmail, which has tracking. Shipping to Europe takes approximately 3-5 business days. Shipping to the US takes approximately 7-10 business days. Shipping to Australia takes 2-3 weeks. If you are ordering an item for a special occassion, please leave plenty of time as the timings above are only approximate and parcels can take longer. Items are wrapped in tissue and packaged in bubble-lined jiffy envelopes with waterproof labels, or hard-backed envelopes. Descriptions and specifications - Whilst every effort is made to ensure colours displayed are a close representation, slight variations in the actual goods may occur. 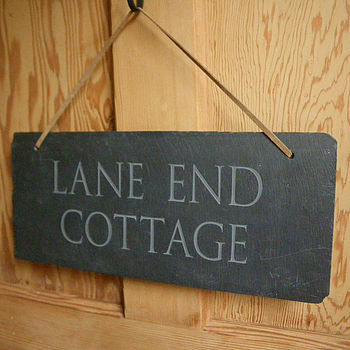 As all of our items are made by hand, small variances may occur in each finished article. 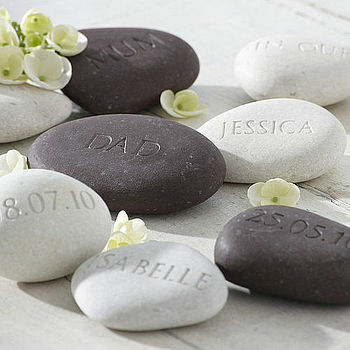 Pebbles - Due to the nature of stone, each pebble is slightly different. They are various sizes (on average about 7cm), shapes (oval -ish!) and colours (shades of plum-grey and white). 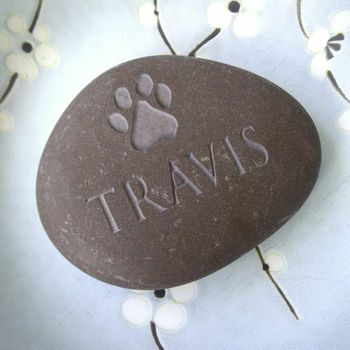 Please note this is a natural product, so pebbles will vary in size, colour, shape and texture. We think this is part of their charm as each one is unique, but please be aware that the photograph is an example only and your stone will be different. Shapes can be irregular and there are sometimes marks and fissures that occur naturally in the stone. I’ve sourced the stones from a quarry in the UK that specializes in landscaping and water features. 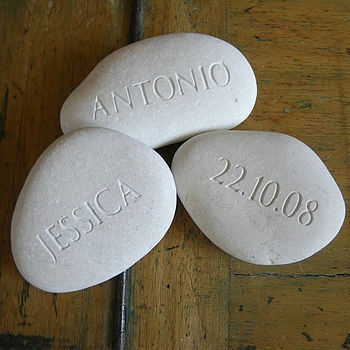 As we engrave each pebble individually, the size of the text or image sometimes varies according to the size of pebble. Occasionally, when pebbles knock together, they leave small white marks on the surface - this is superficial and can be removed with a damp cloth. Duties and local taxes - Purchasers are responsible for any duties and/or taxes levied at the point of entry into the destination country. Liability - Nothing in this agreement affects the statutory rights of a consumer. Subject thereto all representations, warranties, guarantees and conditions express or implied, statutory or otherwise are expressly excluded and Letterfest does not accept liability for loss, damage, or injury howsoever arising. Letterfest's total liability for any claim howsoever arising shall not exceed the price of the goods supplied by Letterfest to the customer.